Robin Youngs, Edward Fisher,	The Journal of Laryngology & Otology, Volume 127 Issue 12, p 1155. E E Hoskison,	The Journal of Laryngology & Otology, Volume 127 Issue 12, pp 1156-1159. A Ghani, M C F Smith,	The Journal of Laryngology & Otology, Volume 127 Issue 12, pp 1160-1168. B J Baker, A Curtis, P Trueblood, E Vangsnes,	The Journal of Laryngology & Otology, Volume 127 Issue 12, pp 1169-1176. P Prinsley,	The Journal of Laryngology & Otology, Volume 127 Issue 12, pp 1177-1183. S G MacKay, N Jefferson, N S Marshall,	The Journal of Laryngology & Otology, Volume 127 Issue 12, pp 1184-1189. J Powell, E L Powell, K Conroy, C Hopkins, J W Moor, J A Wilson,	The Journal of Laryngology & Otology, Volume 127 Issue 12, pp 1190-1193. Z Shen, G Zhan, H Deng, Y Ren, D Ye, B Xiao, J Guo,	The Journal of Laryngology & Otology, Volume 127 Issue 12, pp 1194-1202. D W Hamilton, P J McMeekin, P Dyson, A K Robson,	The Journal of Laryngology & Otology, Volume 127 Issue 12, pp 1203-1207. Z Boy Metin, S Aydin, M Unur, B Cakmakoglu, B Toptas, G Hafiz, T İsbir,	The Journal of Laryngology & Otology, Volume 127 Issue 12, pp 1208-1213. W S S Tsang, J K Y Yu, K S S Bhatia, T K C Wong, M C F Tong,	The Journal of Laryngology & Otology, Volume 127 Issue 12, pp 1214-1221. S G MacKay, N Jefferson, L Grundy, R Lewis,	The Journal of Laryngology & Otology, Volume 127 Issue 12, pp 1222-1225. A Khan, P Stimpson, A Karmolinski, N Patel,	The Journal of Laryngology & Otology, Volume 127 Issue 12, pp 1226-1229. K C Park, G Wong, J C Stephens, H A Saleh,	The Journal of Laryngology & Otology, Volume 127 Issue 12, pp 1230-1234. R D Angeli, M Lise, C C Tabajara, T B Maffacioli,	The Journal of Laryngology & Otology, Volume 127 Issue 12, pp 1235-1237. 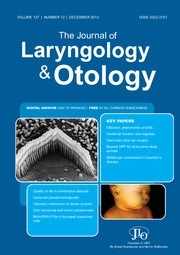 K J McNamara, R P Exley, S Khwaja, R K Bhalla,	The Journal of Laryngology & Otology, Volume 127 Issue 12, pp 1238-1241. M Oyewole, O Ajayi, A Hilger,	The Journal of Laryngology & Otology, Volume 127 Issue 12, pp 1242-1243.